Red Heart yarn is great for long lasting afghans. This is one of my all time favorite patterns. Fast and fun to crochet. 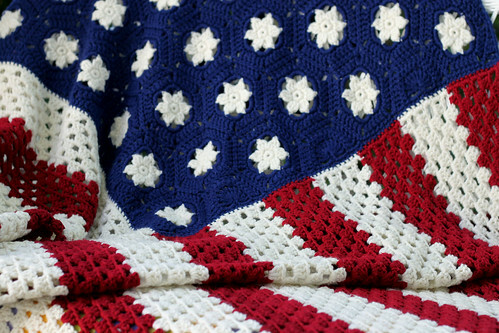 This entry was posted on Saturday, July 4th, 2009 at 3:00 am and is filed under Crochet. Tagged: Afghan, Crochet. You can feed this entry. You can leave a response, or trackback from your own site. This is really neat! Happy 4th to you, too! That is so cool – I am saving this one! Do you have a link or a place I could get the pattern?? The pattern is in a 1994 Leisure Arts Publication called “Crochet Collection”. ISBN0-942237-55-2. The pattern may be in other Leisure Arts publications because I think the book I have is a collection of patterns. This was a really popular project after 9-11. That is when I crocheted this one. I absolutely adore this afghan! Americana has always been my favorite thing to collect.